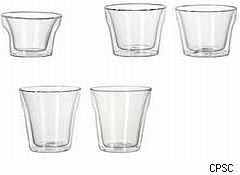 IKEA is recalling about 128,000 of its "RUND" clear glass mugs after a dozen incidents of them shattering while being used, the U.S. Consumer Product Safety Commission said. About 13,000 of the mugs were sold at IKEA stores across the U.S. and another 3,000 were purchased in Canada. The rest were sold in other countries.One person was injured and required medical attention, the CPSC said. Another 11 incidents were reported outside the U.S., including four resulting in injuries. The Chinese-made mugs were sold from October 2009 through March 2010 for $5 to $10, the CPSC said. The glasses are double-walled and were sold in two-packs of the following sizes: 4cl, 21cl and 40cl. If you have the mugs, stop using them and bring them to an IKEA store for a refund. For more information, call IKEA toll-free at (888) 966-4532.